Before I begin, I should probably mention that I hate hockey. Despite my obvious failing as a Canadian, Jim Sands Presents’ production of Charlie: A Hockey Story at the Toronto Fringe Festival almost made me change my mind. Almost. 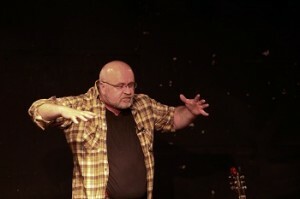 Jim Sands is a storyteller, actor, and musician, and all of these skills come into play in his telling of the story of his uncle Charlie’s career as an NHL hockey player in the 1930’s and 40’s. He combines this story with that of his difficult relationship with his father, and his love for Shakespeare, while taking on the characters he describes, singing and playing guitar, and even performing some Shakespeare. Sands’ ability to weave together three such disparate narrative elements is impressive, though towards the end of this 75 minute show some of his stories begin to feel repetitive. For the most part, however, his uncle’s story is not only entertaining, but also a fascinating glimpse into earlier days of professional hockey. Sands is a confident, relaxed, and engaging performer, who actually listens to his audience as he interacts with them. For those who aren’t fans of audience participation, be warned that you will be coaxed into a brief sing along and some dialogue about favourite hockey teams – but don’t worry, no one has to go up on stage. As the show reaches its conclusion the three stories become one, as his uncle’s career, his relationship with his father, and the power of Shakespeare become entwined in a reflection on forgiveness. So whether you’re a fan or not, Charlie: A Hockey Story, is about much more than hockey. -All individual Fringe tickets are $10 at the door (cash only). Thanks for the free ticket to this. I agree. I really liked what he set out to do and have been thinking about how all the threads came together, especially in light of seeing snug harbour just before this one. Both were plays not just about an event in time but relationship to a dad and to oneself. It’s downfall was the repetiveness, which I’m sure can be tightened up as the show evolves during the tour. Jim is really engaging so play along with his prompts to sing, cheer and participate!